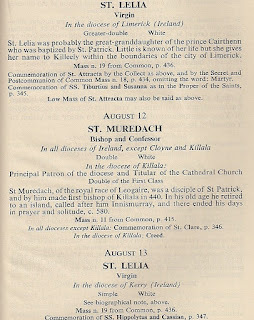 Today is the 136th anniversary of Our Lady's apparition in the little town of Knock in the County Mayo . . . and of St Joseph and St John the Apostle, too, for that matter. The day merits the status of feast in Ireland but doesn't seem to get a look-in in this country. There are a few pages on the net that tell the story, like this one and this one. The shrine itself has its own page here. Our Lady of Knock, pray for Ireland and for us. Or thereabouts. The weather thingamabob on my phone says it's actually only a balmy 94º. But since it's warmer in here than it is outside (because as you learned long since in this space, the computer room is not air conditioned), I'm going to go with the 100º headline. And that's why just a few notes for today. 98 years ago this day Fr Willie Doyle, S.J. was killed in France by an exploding shell. The details of his death are related here. There are more than a few posts about Fr Doyle in The Inn but this one probably has more about him than most. O blessed couple Joachim and Anne, all creation is indebted to you, for through you we have been enabled to offer to the Creator a gift surpassing every other gift, namely that chaste Mother who alone was worthy of the Creator. Rejoice Joachim, for of thy daughter a Son has been born to us and he is called the Angel of the great counsel, that is of the salvation of the whole world. O blessed couple Joachim and Anne! On a certain occasion Christ said: " It is by their fruit that you will know them", and indeed it is by the fruit of our bodies that we recognize your own purity. You ordered your lives in a manner such as was pleasing to God and worthy of her who was to be born of you. By the chaste and holy fulfillment of your married state you produced the treasure of virginity. 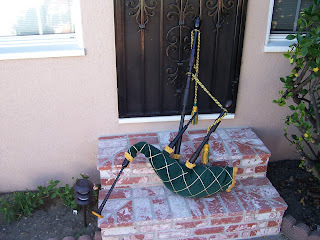 And finally, although I mentioned it a couple of times on FB, I failed to let you know in time that the World Pipe Band Championship was being held last Friday and Saturday. But all is not lost. Even if you missed getting up in the middle of the night to hear the competition live-streamed in its entirety, the BBC has had mercy on us and recorded it all and put it on line in whole band segments. You can find it here. And -- IMHO, of course -- the production is really well done: outstanding colour, sound, and camera work. And the piping isn't too shabby either. And I am now off to the only room in the house with air conditioning, the one the pc is not in. And speaking of August 13 . . . .
Friday the 13th comes on a Thursday this month. All the usual precautions apply, i.e., no walking under black cats, etc. It's bad luck to be superstitious. And speaking of music . . . .
After something of a dry spell, I'm looking at two gigs in a row. I had to do a bit of re-hemping maintenance yesterday that I've been putting off. The blow stem joint, as is its wont, was getting a bit grotty. And that reminded me that the drones hadn't been oiled in a while. And that reminded me . . . and there went the afternoon. The folks this afternoon only seem to want the inevitable Amazing G. Pretty straightforward on paper. But we shall see what else is requested. One hopes not too much. A lot of Scottish wool is being worn for 90º heat. Labels: . . .leaning a fond ear to the drone he may have parley with old folks of old affairs. 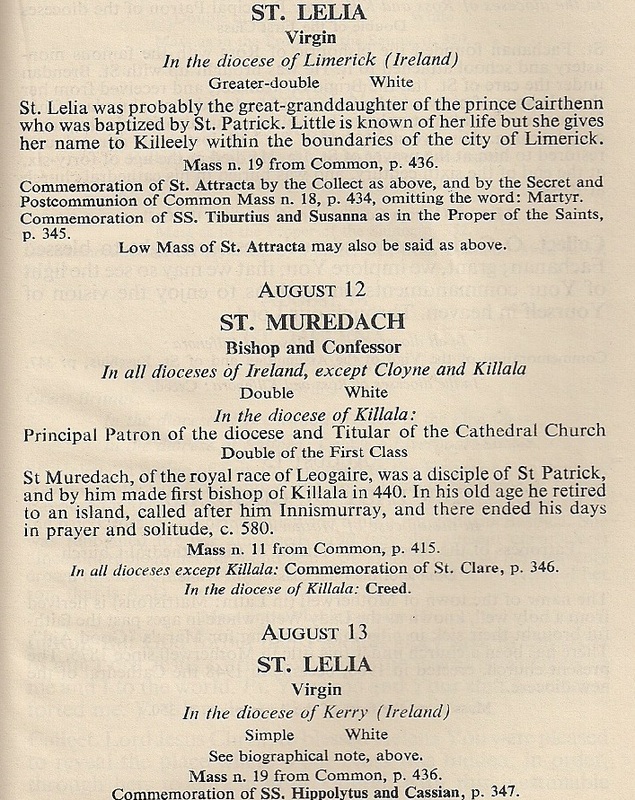 In the old calendar, St Lelia's day was kept only in the diocese of Kerry. The new calendar she shares yesterday with Ss Muredach and Attracta. There is more on St Lelia here, but alas, largely speculation. "A Regular and General Musical Education"
It would be a direct contribution to the children of the land, of a large mass of solid enjoyment, of an innocent character, and worth more to them than an ingot to each, massy as they could bear home, of Californian gold. Of course, this was written in 1853 so he was writing of actual music and not electronic noise. And so, as originally intended, a splendid idea. August 12 is the commemoration of the fifth abbot of Iona, Saint Ségéne. . . . Saint Ségéne had a long and interesting reign as a successor to Saint Colum Cille of Iona. He was one of those related by blood to the founder and he featured prominently in the Paschal Dating Controversy. Abbot Ségéne was one of those implacably opposed to accepting the Roman computation for the date of Easter. Always delighted to find another liturgical traditionalist. More from the Disney-Has-A-Lot-To-Answer-For Dept.